Competition has always been part of the scientific process — deciding who the leader is in this type of sport. It is therefore only natural that there remains the question of which magnet is the largest. The answer to this question is rather unexpected for a person accustomed to a world of technological magnets — spiral galaxies, star islands, are the largest in size known to modern science. The galaxy we live in, the Milky Way, is a particularly gigantic one. The brilliant Enrico Fermi was the first to conceive this idea in the late 1940s, dwelling on what might be withholding cosmic rays in the galaxy. Fermi correctly evaluated the magnetic field strength of our galaxy and he was generally right in his understanding of its configuration. One can only envy the ability of a scientific genius to make the right conclusions from a very limited body of facts and resist from guesswork on the basis of these facts. Almost at the same time, B.A. Vorontsov-Velyaminov, an outstanding Russian astronomer, mentioned Fermi’s findings in his textbook on astronomy for senior secondary school pupils, in such a way that his text can be incorporated into modern reviews of galactic magnetic fields practically without any alterations. Unfortunately, this is no longer part of the school curriculum. Generally speaking, the phenomenon of magnetism is widely spread in space. The Sun has its magnetic field, as do many of the stars and planets. If you come to think of it, the Earth is also a magnet. It is generally said that in celestial bodies and in the cosmos magnetic fields are detected with the help of the Zeeman effect, i.e. by the splitting of spectral lines in the magnetic field. It was this way that the magnetic field of the Sun was discovered. However, galactic magnetic fields are observable through the Zeeman effect only in exceptional cases, in those regions of a galaxy where these fields are anomalously large. The spectral lines become wider due to the Doppler effect accounting for the motion of radiating atoms. Thus, the relatively small spectral line splitting caused by the galactic magnetic field is usually unobservable. Another effect can be helpful — the Faraday effect. It consists in a plane of light polarization rotating as the light goes through the medium if it is a mirror asymmetric one (for example, a sugar solution – there are sugars of only one of the two mirror asymmetric configurations in organic substances). The magnetic field also appears to make the medium mirror asymmetric, and synchronous radiation (present in many celestial bodies) is polarized. The rotation angle is proportional to the magnetic field projection on the line of sight, thermal electron density of the medium, path length, and the square of wave length radiation. In galaxies, the path length is enormous, and even in a very small magnetic field the rotation of the polarization plane is considerable. The rotation does neither have to be very large, because then the polarization plane rotates many times, and observations are difficult to interpret. The best conditions for observing Faraday rotation are in the radio diapason, at a wavelength of the centimeter diapason. Speaking of the weakness of galactic magnetic fields, we compare them with magnetic fields of technical devices and the Earth’s magnetic field. In actual fact, this comparison doesn’t seem fit — the world of galaxies has its own scale. It is better to compare the energy density of a magnetic field and, for instance, the density of chance motions of interstellar gas, in which the magnetic field is located. These energies turn out to be approximately the same. In other words, on its natural scale the galactic magnetic field is much stronger than most of the magnetic fields we are accustomed to – it can influence the dynamics of a medium. The same can be said about, for example, the magnetic field of the Sun. Specialists believe the magnetic field in the depths of the Earth to be capable of considerably affecting the currents in the fluid of the Earth’s outer core. One should say a few words about another difference between the magnetic fields in space and in technical devices, before defining what the galactic magnetic field is from the quantitative point of view. We usually draw a link between magnetism and ferromagnets — the phenomenon is often studied using the example of a horseshoe magnet at the beginning of the school course of physics. Ferromagnetism is very rarely found in space. So there is no point drawing a line between the intensity of a magnetic field and magnetic induction, the measurement unit of the magnetic field being gauss, not oersted. Practice has shown that foreign editors don’t mind this tendency, while Russian ones do. Summing up, the intensity of the galactic magnetic field is about several microgauss. A large body of data was accumulated during the 30 years following Fermi’s guess; a lot of information was obtained concerning the Faraday radiation rotation of extragalactic radio sources and pulsars, i.e. galactic sources of polarized radiation. As a result, there appeared a chance to study the structure of the Milky Way in a more or less detailed fashion in the 1980s. This magnetic field appeared to be located in the galaxy plane and to be nearly symmetrical to the central plane of the galactic disc, approximately perpendicular to the direction towards the galaxy center. This is a very rough symmetry – various disturbances overlap with the average magnetic field. Such a structure of the magnetic field seems to be natural. However, the dipolar magnetic field we are accustomed to (for instance, that of the Earth) is structured very differently – it is perpendicular to the Earth’s equatorial plane. Otherwise stated, the magnetic field of the Milky Way has a quadrupole symmetry, not a dipolar one – it doesn’t go from one pole to the other (a poloidal magnetic field), being directed almost azimuthally (toroidal magnetic field). There are also actually both variations from the toroidal magnetic field and a poloidal component, but they are relatively weak. Fig. 1. The Radio Telescope in Effelsberg, Germany. Located in the beautiful mountains not far from Bonn, it was used to observe the magnetic fields in external galaxies for the first time. 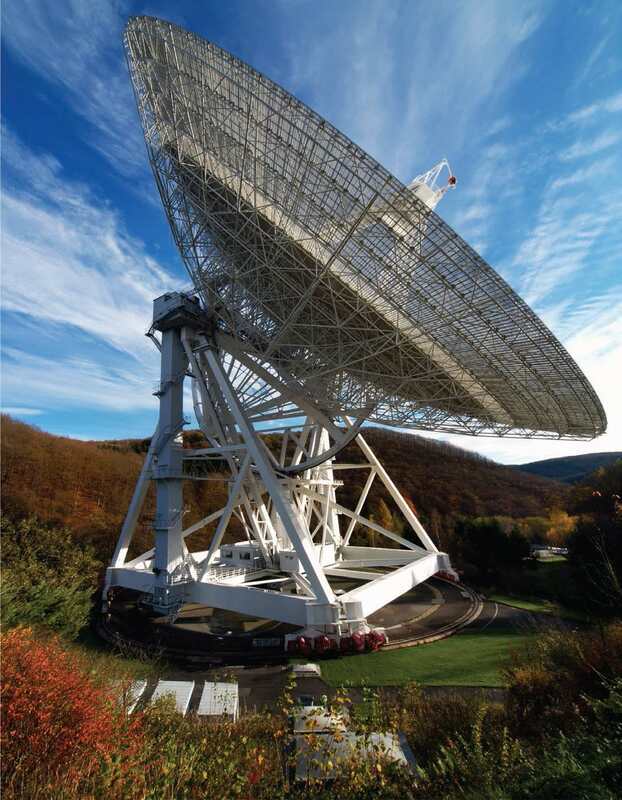 The Effelsberg telescope still plays an important role in studying galactic magnetic fields. Unfortunately, we are observing the Milky Way from inside, not seeing the wood for the trees. It is very useful to look at the situation from outside, observations of external galaxies being very valuable. Such observations appeared in the 1980s. Most of them were carried out by the astronomers of the Max Plank Institute for Radio Astronomy in Bonn. The scientist who made it possible was Richard Wielebinski. Endowed with a flamboyant personality, Wielebinsky was of Polish descent and studied radio astronomy in Australia. Among other things, he was strongly for international collaboration, our country being included. By that time Germany had already heeled the main wounds from the military catastrophe, but German science still had a long way to go to reach its prewar standards. It was necessary to define those subfields in which it could achieve leading positions with reasonable effort made. The new modern telescope was beginning to function in Effelsberg, not far from Bonn. The first observations showed that the radio radiation of external galaxies was polarized. This radiation has a synchrotron nature, caused by the motion of relativist electrons in the magnetic field. A synchrotron radiation is polarized with a high degree of polarization (nearly 70 %). No one was surprised by the presence of some magnetic fields in galaxies – astronomers were used to explaining everything that was unclear with the help of a magnetic field. These magnetic fields were traditionally thought to have a very small space scale, and not believed to be connected with the whole of the galaxy, only some of its local objects. If one takes this viewpoint, the polarization of the radiation coming from various parts of the galaxy has to have different polarization plane orientations, so on the whole it will not be polarized. But in practice polarization was actually observed. But, of course, not 70% were polarized – only about 10 %, but in astronomical terms that was a considerable amount. Wielebinski was correct in his assumption that this was a far-reaching area of research. It should be stressed though that there was a great distance to cover from simply observing polarization to defining the structure of the external galaxies’ magnetic field. The direction of future research was chosen with good sense, and the initial impulse turned out to be so strong that it has affected the state of matters in this field of study ever since. Competing research groups are, however, also being formed in other scientific centers, primarily in Holland. The intensive work of a Moscow group of theoreticians studying the origin of galactic magnetic fields was another happy circumstance that affected the situation in the field. Jacob Borisovich Zel’dovich, a wonderful Russian physicist, was the supervisor of this group. He managed to attract many young researchers who were interested in a variety of astrophysical problems. For a long time theoreticians had been focused on the origin of the magnetic fields of celestial bodies, the Sun in particular. As far back as in 1919 Sir Joseph Larmor understood that there could be no other mechanism able to generate the solar magnetic field but electromagnetic induction. The idea of a ferromagnetic in the center of the Sun is inconceivable even as a joke. ‘Dynamo’ was the term coined for the mechanism, as an analogy with what was then called the dynamo machine. This term goes together with the word hydromagnetic – in order to underscore that there are no solid conductors or other irrelevant components. The theory of the solar dynamo had been more or less developed by the early 1980s. It was clear that the dynamo mechanism could be used to explain the origin of magnetic fields in other celestial bodies. The principle of a hypothetical dynamo functioning in the galactic disc was described in a number of publications. The first among them was written by S.I. Vainshtein and A.A. Ruzmaikin (published in 1972), simultaneously with the work written by D. Parker, an outstanding American astronomer. These authors pioneered the description of the galactic dynamo. Although international collaboration was difficult to put to practice, Y.B. 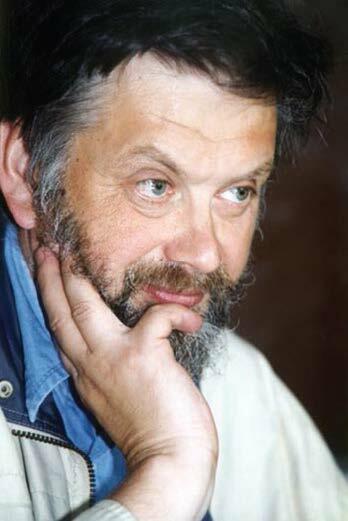 Zel’dovich was a person who aspired to share data and work together. A considerable achievement was the publication of his book Magnetic Fields in Astrophysics written together with A.A. Ruzmaykin and D.D. Sokoloff (Gordon and Breach Publishing House, New York) in 1983. Understandably, we were writing about phenomena we had analyzed in depth, so most of the book was devoted to the galactic dynamo. The book produced a profound impression on the readers. In those days our compatriots rarely wrote books abroad in English right from the start, but what was most important was that the problem of the magnetic fields of the Milky Way had taken such a considerable place in a scientific monograph. Other research groups working in this area mainly focused their studies on the solar dynamo. We were also aware of a new area of research coming into view. I remember very well listening to a talk by Reiner Beck, a talented radio astronomer from Bonn, who had just discovered the polarized radiation from the Andromeda Nebula – M31. This radiation wasn’t just spread across the whole galaxy disc – it was concentrated in the ring. It was there that the magnetic field of this galaxy might be located. But the observers could not understand why it was focused in the ring. 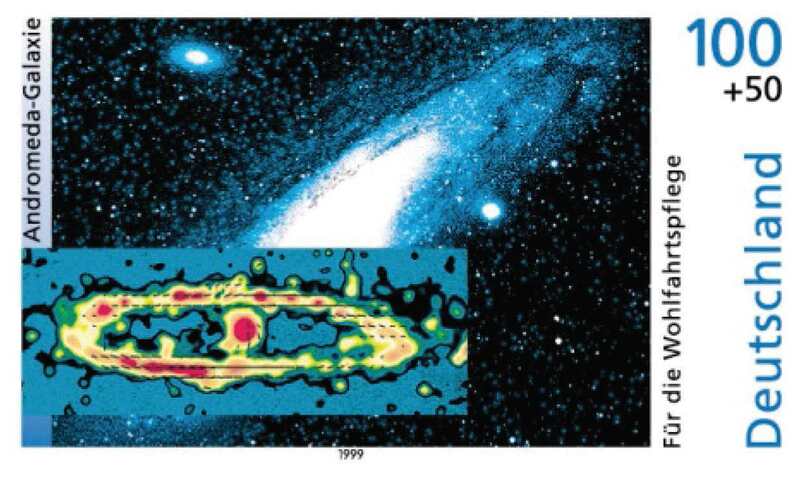 However, we knew that Anvar Shukurov, Sasha Ruzmaykin’s student, had recently published a paper on the way the magnetic field of M31 was expected to be spread – it was concentrated in the ring that was situated where the ring of polarized radiation was. In those times it was rather difficult to approach a visitor coming from the distant West Germany and tell them about one’s ideas. Sasha, however, was able to literally go through a wall, so in several months our German colleagues became informed of our findings. Our effort resulted in the proposal to write a book on galactic magnetic fields together (different ones, not just that of the Milky Way) for the Durnebaal Reidel Publishing House in the city of Dordreсht, Holland. Back then Dordrecht was seen as something from another world (so was the whole of Holland). Many years later I was in Holland and took a day off to visit the city where the book Galactic Magnetic Fields by A.A. Ruzmaykin, A.M. Shukurov and D.D. Sokoloff had been published in1988 (although the publishing house had been renamed as Kluwer – business, you know). That time we managed to publish the Russian version in our country, in the Nauka Publishing House. We had been waiting for the Russian edition of the first book for a quarter of a century. Luckily for us, the theory of the origin of galactic magnetic fields was not an indispensable part of the Bonn research group’s scientific conception. So, by the standards of that time, there very quickly appeared close cooperation between our teams, and in 1989 we made our first joint preprint. Scientific bonds were being developed, and many members of our group became scientists who worked abroad. For this reason the following extensive review of galactic magnetic fields published in 1996 was written by a rather large group of authors from a number of European countries, the review still being traditionally referred to in all papers on the subject. It should be noted that there was an internationally recognized research team working on the dynamo in Germany. The team worked in Potsdam, in the German Democratic Republic, but this did not exclude the possibility of doing research with the group from Bonn, even though it wasn’t an easy task (again, one should say that very often colleagues from distant countries are much easier to cooperate with than one’s neighbours). One way or another, Axel Brandenburg was among the physicists who had written the review – he was from the Potsdam group and worked in Copenhagen. A. Brandenburg is currently the leading expert on the direct digital modelling of cosmic magnetic fields in the Nordic Institute for Theoretical Physics (NORDITA). The first results of studying galactic magnetic fields raised an unexpectedly great public interest. There was no Internet in those years, but there were requests for article reprints, and not replying to them was generally thought to be impolite. I remember sending a reprint in response to a request from the Cairo Zoo. The galactic dynamo works in accordance with the same principles as the solar dynamo. The Lenz law, well-known to everyone from the school curriculum, appears to be the main obstacle in the way this mechanism functions: electromagnetic induction creates a new magnetic field, so that the primary magnetic field is decreased (not magnified) by the secondary one. The self-excitation of the magnetic field (what the dynamo actually is) is thus possible only provided that there are two effective loops, in which case the former creates a magnetic field in the latter, the latter using the field produced and creates its own new one in the first loop. It should be noted that the Lenz law does not prevent the newly created field from being added to the primary field. Fig. 3. The results of studying the magnetic field of M31, shown on a German post stamp. It took experts working on the dynamo about 50 years to understand how to model this phenomenon in natural conditions. The magnetic field of the first loop can be presented as the magnetic field of a dipole or a magnetic quadrupole. It is called poloidal. It is frozen into the highly conductive rotating medium. This rotation is practically never a solid body one — solid bodies are rare in space. The poloidal magnetic field generates a toroidal one directed azimuthally, because different parts of the magnetic line rotate at their own angular speed. This aspect of the dynamo does not raise much doubt. The problem was reconstructing a poloidal magnetic field from a toroidal one. It became clear by the 1960s that the only realistic way for such a phenomenon to occur in cosmic conditions was connected with the breaking of mirror symmetry convection (or turbulence) in a rotating body. This accounts for the presence of an electric current component that is parallel – not perpendicular – to the magnetic field. M. Steenbeck, F. Krause and K.-H. Radler, scientists from GDR, formulated and developed this idea in a clear form accessible to quantitative analysis. This is perhaps the most famous and important discovery made by GDR physicists. The term ‘alpha effect’ was coined to denote this phenomenon. Surely, with time physicists learned to describe the alpha effect at an adequate mathematical level. The main difficulty with the alpha effect is, however, psychological. Our entire experience of studying at school and university – and in general physics as a whole – is based on the a priori assumption that we are dealing with mirror symmetrical media. It is in the micro world that mirror asymmetric effects begin to play a considerable role. They were found approximately in the same time when the idea of the alpha effect was conceived. Simultaneously, physicists became accustomed to elementary particle bahaviour being at odds with the categories of sound judgement, but something of this kind occurring in a large scale world was hard to imagine. Mirror symmetry is actually broken by the overall rotation of a body, this being the galaxy in our case. Amusingly, this fact is considered evident in geography: Baer’s law states that rivers flowing in different hemispheres flow along opposite banks. Absolutely the same idea is applied in another context in the dynamo. Let us emphasize that the dynamo is a threshold phenomenon. Induction effects must dominate over ohmic losses of the magnetic field related to the ultimate conductivity of a medium. In the galactic world this generation threshold is overcome by the enormous spatial scales of galaxies. In terms of galactic dynamo properties, it is understandable why magnetic fields occur in spiral galaxies and some other close galaxy types: these are the galaxies that rotate. Scientists managed to figure out why the configuration of galactic magnetic fields differed greatly from the structure of the magnetic fields of the Sun and the Earth. The dynamo appeared to be working in a certain layer in all these cases, although the angular velocity can change both along this layer and across it (in other cases). It wasn’t obvious in advance, to put it mildly, that such a seemingly negligible detail could lead to strikingly different results. Of course, it is significant that the conditions of observing the magnetic fields are different in all these cases, so at the start we see what is most easily observable. It was natural that the first models of generating magnetic fields in galaxies were generalized and similar. We were of course very lucky to see a vivid detail in these models (the M31 ring), that could be seen during observation. This phenomenon even found its way to one of the German post stamps released by the German Post. Observers found numerous details of great beauty and variety, and theoreticians learned to explain them with this or that degree of accuracy in the years following those events. In some spiral galaxies (for example, NGC 6946) the magnetic fields turned out to be drawn together into various magnetic arms which are located between spiral arms formed by gas and stars. Theorists tend to interpret these arms as a kind of transient, i.e. a magnetic structure that hasn’t yet reached its equilibrium state. Other examples of such transients are well-known. For example, the magnetic field in the galaxy that we live in, the Milky Way, changes its direction several times along the galactic radius. The simplest models of the galactic dynamo predict that a galactic magnetic field should not contain such elements in the final stage of its evolution. Their formation in real galaxies is explained by the fact that these celestial objects – very old judging by human standards – are very young indeed in the magnetic sense. In actual fact, 0.5 billion years is the typical time span of a galactic dynamo being able to considerably reconstruct a magnetic field in a given area of the galactic disc. This is, of course, substantially less than a galaxy’s age comparable to 10 billion years, but the gap between these time scales is not that large. It is also of importance that a galaxy never stays invariable during its lifetime. It is affected by such phenomena as outbursts of stellar formation, the emergence and disappearance of spiral gaseous arms, interactions with neighbouring galaxies and so forth. A comparatively slow galactic dynamo does not have enough time to smoothen the effects of such events. As a result, in different parts of the galactic disc there appear fragments of final magnetic configuration that stack poorly with each other. It is these fragments that are transients. Their formation is particularly aided by the magnetic field being a pseudovector. This means that only the value of the magnetic field vector and the line on which it lies can be predicted. There cannot be a physical reason that defines the direction of the magnetic field. That is why the magnetic field can have opposite directions in different fragments of the magnetic configuration, and there can be long-life rotations of the magnetic field on the borderline of the fragments. Such internal borderline layers (they are also called contrast structures) are known in most areas of physics (for example, in semiconductor physics). A.B. Vasilyeva, a wonderful Russian mathematician, and her disciples developed powerful calculation techniques to study contrast structures. We have used the ideas of this research team extensively, but, of course, the formal analogy between semiconductors and galaxies was completely unexpected. Fig. 4. Magnetic arms (defined by coloured contours) in Galaxy NGC 6946 are located between the arms formed by stars and interstellar gas distributed in space that are seen in the optical picture of the galaxy (black and white). Spiral galaxies are not just rotating gaseous and stellar discs. Various structures are differentiated among them. For example, a specific linear structure can be seen in the central parts of some galaxies – it pierces the central area like a needle. Spiral arms are spread from its ends, so it is usually called ‘peremichka’ in Russian, although the English ‘bar’ is used more often in spoken speech. Magnetic fields having a bar were studied within the framework of a special Russian- German project launched by the Russian Fundamental Research Fund (RFRF) and the German Scientific Society, to whom we express our deepest gratitude for this undertaking. The rotating bar turned out to be considerably changing the standard configuration of a magnetic field, and, what’s more, there appear magnetic lines along which substance can flow supplying a black hole that seems to be in the center of a galaxy. Up to now galaxies having bars are the only morphological class of galaxies that has been studied in detail both observationally and theoretically. Describing the results of this thorough analysis required making publications in a variety of scientific (and popular) journals, including the most prestigious ones, and the practice of reviewing the results achieved allowed us to arrive at some interesting scientometric conclusions. As we had thought before, our findings were worth being published in some of the most cited editions, like Nature. And as the corresponding results came in, we were sure to do that. But in practice, at least in astronomy such a high ranking publication alone does not produce any special impression on the scientific community and neither leads to a flow of references. Of much greater importance is the support of a pilot article by the subsequent extensive publication of one’s findings in a series of scientific journals on the subject in question – from prestigious editions addressing the broader scientific community to local journals read by experts in more specialized areas of research. Thus the citation index turns out to be nearly the same as in the case of an article published in Nature. As football players say, discipline beats class. Naturally, not all our initial expectations had been confirmed in the course of the research. For instance, galactic magnetic fields often create the impression of being connected not so much with the galactic disc as a whole, but the spiral arm in that disc. The directions of magnetic vectors are indeed close to the directions of spiral arms. They are close, but not identical. Gaseous arms definitely distort the propagation of the magnetic field, but they do not cause it by themselves. Another misconception overthrown in the course of our study was the idea that a galactic magnetic field could be formed as a result of twisting the primary homogenous magnetic field frozen into the substance from which the galaxy had arisen. Such a hypothetical magnetic field is called a ‘relic’ one. This notion seemed very attractive at first – there was no need to think of any mirror symmetry or other difficulties. However, calculations show that a relic magnetic field cannot survive in rotating galaxies, and if (by some miracle) it did, its configuration would be very different from the observable one. The development of a particular area of science is not always determined by purely scientific needs only. Constructing new telescopes that improve the quality of observation is a complicated and costly process requiring very serious international and interdisciplinary cooperation. It would be impossible to imagine a new powerful radio telescope being constructed just to solve a single scientific problem. That is why preparatory work before conducting observations with the help of a new device takes more than several years and leads to resvising the whole system of research groups in a particular area of study. Fig. 5. 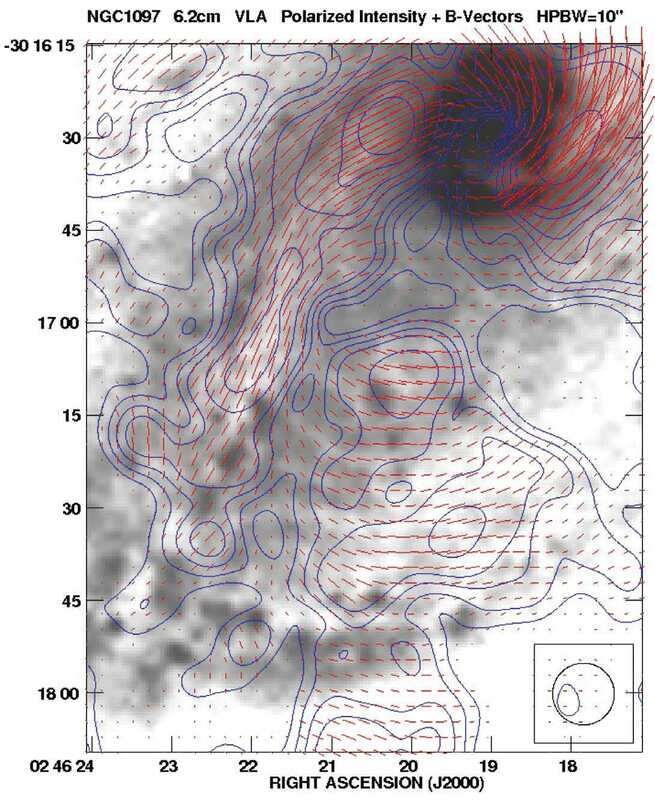 A segment of the NGC 1097 magnetic field. The short lines match the direction of the magnetic field, and the contours characterize its intensity. The data obtained from radio observations cover the optical picture (black and white). The galaxy bar can be seen coming from the bottom left corner to the upper right corner of the picture. One can see the magnetic field drastically changing its direction near the bar — where the impact wave is. The substance is flowing along the magnetic lines into the center of the galaxy and supplying the black hole situated there. The LOFAR and SKA radio telescopes are very likely to become the next telescopes to observe the magnetic fields of galaxies. A specific feature of the former, its construction nearly finished in Holland, is that it consists of the basic nucleus and additional stations located in a number of European countries. One of these stations is situated in the suburbs of Krakow, in a World War I fort. One can learn many new things by having a closer look at this observatory of Jagiellonian University. When I first saw this observatory a quarter of a century ago, there wasn’t a single more or less up-to-date piece of equipment, any money, any expert observers who could conduct modern research. But there certainly was a clear understanding that your own effort was the only way to cope with all these problems. M. Urbanik and K. Otmyanovska-Mazur, the leaders of the observatory research group, established cooperative links between astronomy students with observers from Bonn, with R. Beck in particular. Those young scientists grew into experienced observers and borrowed their German colleagues’ knowledge concerning observational projects. The money for building the LOFAR station was found with time, the construction of such an object being relatively simple from the technical point of view. I remember vividly visiting a similar telescope near Kharkov during my post-graduate studies. The Krakow astronomers conducting observations got the support of theoreticians from Torun. Although the country’s resources were limited, this lead to Poland becoming the leader in this area of scientific endeavour. There is much to learn from this scenario. The technical idea underlying the LOFAR radio telescope suggests observing at much larger wavelengths than in the case of using radio telescopes that have been used in most of the previous observations. This means that the plane of radiation polarization coming from a distant galaxy can complete a full rotation many times. These complete rotations are not seen in observation, but knowing their exact number is required to reconstruct a galactic magnetic field. And at this point one is confronted with the challenge of decoding a signal that has undergone a large number of polarization plane rotations. This problem is indeed difficult, yet not utterly unpromising. It is now being analyzed by radio astronomers from many countries. Certain progress has been achieved, but there is still much to be done before the situation becomes quite clear. The SKA radio telescope is assigned a much wider diapason of wavelengths that includes short ones as well. This is a very inspiring fact. Unfortunately, the construction of this object is being constantly postponed, and its designers have to cut expenses, the economy being accounted for by the necessity implied to study the magnetic fields of galaxies in more detail. The generation of scientists to which I personally belong is unlikely to have access to working with the data obtained with the help of SKA. Галактики очень велики по сравнению с Землей, но по масGalaxies are very large as compared with the Earth, but, by cosmological standards, these are tiny objects. Are there any magnetic fields of an even larger spatial scale than in galaxies? Magnetic fields are well-known to be present in galaxy clusters. These clusters are naturally much larger than the galaxy scale. However, as is known nowadays, the magnetic fields in them are of the same spatial size as galactic magnetic fields. In the world of galaxies, there certainly are formations that appear considerably more impressive than spiral galaxies and that have their own magnetic fields. These are quasars, various jets flowing from galactic objects and other active formations. There actually is or is supposed to be a magnetic field in many of them. However, there is still no clear-cut image of magnetic fields in such formations at scales comparable with those of an entire celestial body. It is desirable to believe the existence of such magnetic fields, and the experience of studying the magnetic fields of spiral galaxies can be of great use. Can we think of magnetic fields of an even larger, cosmological spatial scale? It might seem unfeasible to expect to find such magnetic fields — the universe is homogeneous and isotropic with a very high degree of accuracy, and a magnetic field would be creating a certain direction in it, breaking the isotropy. There are actually two gaps in this naïve line of reasoning, and they do open up possibilities of finding cosmological magnetic fields. First of all, a cosmological magnetic field can be smallscale according to cosmological standards, but whether this scale is small in galactic terms is not clear in advance. Research conducted by experts on cosmology indicates that there might be magnetic fields and they seem to have been formed in the early universe. In the roughest approximation, the logic is as follows. The universe is thought to be originally filled by vacuum, from which – as the universe expanded and its temperature fell – all kinds of particles were formed. In quantum physics the magnetic field can also be interpreted as certain particles. It is their formation that generates the magnetic field. Of much greater complexity is the question whether these magnetic fields are large-scale. In a sense, the answer is positive. Mirror symmetry is broken not only in rotating turbulence, but also in nuclear reactions. This leads to the alpha effect too, and the formation of a large-scale magnetic field. The problem is that this field is large-scale in terms of the geometry that existed at the time of its formation. 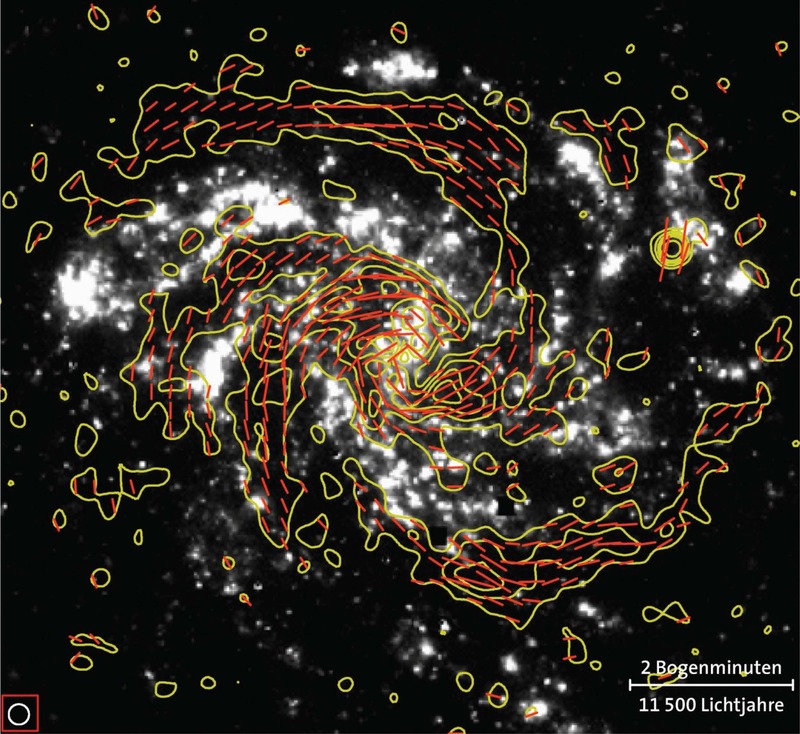 By the standards of modern galaxies, the spatial scale of such magnetic fields appears to be very small. It is extremely difficult to trace what happened to a magnetic field generated at the earliest stages of the life of the universe up to now. Specialists’ opinions vary in this respect, and still it doesn’t seem plausible that these cosmological magnetic fields were directly related to the magnetic fields of modern galaxies. These magnetic fields were particularly incapable of surviving the age when the temperature of the universe had already fallen, and the galaxies had not yet been born. In those times the galactic dynamo had not yet started working, and the magnetic field was weakening, according to Ohm’s law – the electric resistance of a medium was quite noticeable. Y.B. Zel’dovich turned his attention to another much more peculiar possibility. If a homogeneous magnetic field is weak enough, it doesn’t violate the isotropy of the universe too much. But, of course, the magnetic field can be so weak that it doesn’t affect the physical processes occurring in galaxies in any way. There turns out to be a gap between the maximum value of the magnetic field, that is generated from17 the isotropy of the universe, and the minimum value, that is required for this field to preserve its strength so that the galaxies could exist. This gap gradually narrows down, but still remains rather meaningful. Until recently, science only possessed the maximum observational values of the cosmological magnetic field, and Y.B. Zel’dovich’s idea, although very elegant, was thus of purely academic interest. However, several years ago A. Neronov and D.V. Semikoz brought forth convincing observational data concerning the existence of a cosmological magnetic field, and even gave the minimum values of this magnetic field. The values received this way are strikingly lower than the intensity of galactic magnetic fields, but are quite sufficient for these magnetic fields to remain of great interest for astrophysicists. These values are based on a rather complicated analysis of elementary particle reactions proceeding in the cosmic medium, and don’t allow one to judge the spatial structure of the magnetic field. It is definitely not excluded that this magnetic field falls into the space between galaxies with the help of certain physical processes coming from the galaxies themselves, but on the whole the problem of cosmological galactic fields has acquired a totally different meaning now as compared to previous years. WHY SHOULD WE KNOW ALL THIS? There is a certain group of people among our contemporaries for whom the very words galactic magnetism are attractive enough to justify research in this scientific field. This could only be praised: as an area of intellectual activity and a tool for understanding the world, science is not intended to solve immediate practical problems; practical results are achieved as by-products of scientific work. It is, however, interesting to know if there is any chance that the research of galactic magnetism can have an impact on our everyday lives. The state of affairs does not appear to be as unpromising as one might think. The first attempts at reproducing the dynamo effect in laboratory conditions were made in the 1960s. Scientists from our country and from GDR were the first to carry out experiments in this area. Liquid metals are used as a conductive medium in which the dynamo is supposed to function, sodium being used most often, as it takes liquid form at comparatively low temperatures. It is nowadays not quite clear why it was decided to conduct investigations in Latvia. The task turned out to be very difficult technically, but the experts’ painstaking work was finally rewarded in the past weeks of the past millennium – a self-exciting magnetic field was created. It should be noted that the physicists who had achieved this success were representing different countries, although continued to work in Riga. The Russian experimental project on studying the dynamo was launched almost simultaneously. It is being carried out in the Institute of Continuous Media Mechanics, Perm. Among other things, members of the project have succeeded in measuring the alpha effect in laboratory conditions for the first time. Experimental projects on dynamo research are now being conducted in a number of countries: France, Germany, Russia, Latvia and the USA. Creating an experimental basis for working with liquid metal flows is useful in solving many technical problems, although there is still a long way to go to designing technical devices based on the dynamo mechanism. Therefore the Perm project has an obvious practical component. But that’s another story. Frick P., Stepanov R., Beck R., Sokoloff D., Shukurov A., Ehle M., A. Lundgren. Magnetic and gaseous spiral arms in M83. Astronomy and Astrophysics, 585, A21 (2016). Beck R., Brandenburg, A., Moss, D., Shukurov, A., Sokoloff, D., Ann. Rev. Astron. Astrophys., 34, 155-206 (1996). Moss, D.; Beck, R.; Sokoloff, D.; Stepanov, R.; Krause, M.; Arshakian, T. G., Astron. Astrophys., 556, A147, 2013. Moss, D.; Stepanov, R.; Arshakian, T. G.; Beck, R.; Krause, M.; Sokoloff, D., Astron. Astrophys., 537, A68, (2012). Beck, R.; Ehle, M.; Shoutenkov, V.; Shukurov, A.; Sokoloff, D., Nature, 397, 324-327 (1999). Ruzmaikin A., Sokoloff D., Shukurov A. Nature, 336, 341-347 (1988). Beck, R., Frick P., Stepanov R., Sokoloff D., Astron. & Astrophys., A113, 543 (2012). Neronov, A.; Semikoz, D. V., Phys. Rev. D80, 123012, (2009). Соколов Д.Д., Степанов Р.А., Фрик П.Г., УФН, 184, N 3, 313-335 (2014).